I have to admit that I was never into The Flintstones as a kid (my tastes ran more toward the sci-fi/fantasy genre like Thundercats, Dungeons & Dragons and She-Ra) but, as I grew into my teens I slowly came around to enjoying the show and began to appreciate it on a different level. That level being found within the confines of a hollowed out apple bong and suburban-strength weed. I guess you could say that in my life, I associate The Flintstones with lazy afternoons on the couch with like-minded friends, sparking up and laughing at The Great Gazoo (even though he is widly considered the point where The Flintstones “jumped the shark”), which really isn’t that bad of a memory when you think about it. 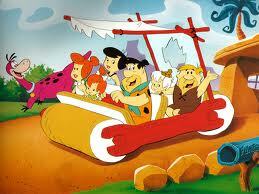 So happy 50th Fred & Wilma, Betty & Barney, and all the rest of the Bedrock crew. HAPPY 35TH ANNIVERSARY STAR WARS!